Tilt angle sensor measures the inclination of the object with respect to gravity. 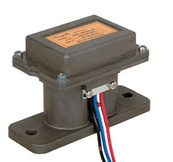 Tilt sensors are widely used in mobile devices, such as personnel hoists as well as agricultural and forestry machines. The sensor always measures the angle straight in respect to the ground. However, some sensors include a separate calibration option, which allows you to set the zero point even if the sensor is installed in an angle.